Thursday was a very special night out for Madtini. 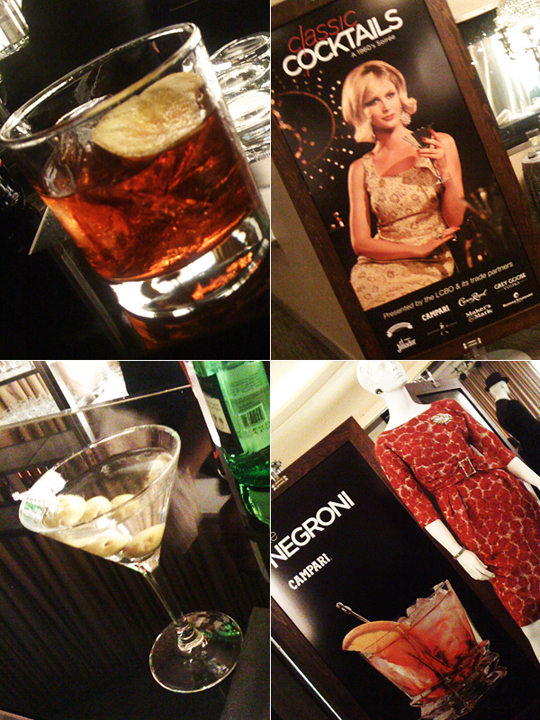 The LCBO hosted a 1960s-inspired party at The Carlu in downtown Toronto to celebrate the launch of their new Classic Cocktails website and mobile site. The evening’s star attraction was Mad Men costume designer Janie Bryant, who gave a short talk on classic 60s style. The folks attending the event were arriving in style as well (heck I even wore a tie). Take a look at some of the 60s-inspired fashion on The Hip and Urban Girl’s Guide and It’s All Style to Me blogs. The website features recipes for 24 classic cocktails, appetizers, product information and a flipbook version of the Classic Cocktails magazine. Do yourself a favour and pick up the magazine the next time you visit an LCBO store. First off Madtini has to thank Anita Clarke of I Want I Got for hooking us up with 2 invites for this great party. The soirée took place in the classic round room at The Carlu. The Carlu alongwith the Design Exchange are two of the best examples of Art Moderne style architecture in Toronto, and was a perfect venue for this celebration of classic cocktail culture. The event featured live musical of the the circle of fifths, great food, and two bar set-ups serving expertly crafted classic cocktails. The bartenders were making drinks with flare, juggling the bottles and garnishing with style. It was now time for the most difficult part of the evening, choosing which cocktail to try first. After some deliberation we went with an ice-cold Grey Goose Vodka Martini as our first choice. We moved on to the Negroni next made with Broker’s Premium Gin, Campari and Martini & Rossi Sweet Vermouth. If I can pass along one party tip, it would be don’t lean over to ask the bartender a question while he’s making the orange flambe garnish. Eyebrows are awesome and it’s nice to leave the party with both of them. For our third and final drink of the evening our server recommended a Rusty Nail, made with Johnnie Walker Black Scotch and Drambuie. The classic cocktails served this evening were a welcome change from the sweet drinks that made up most of our Christmas and New Year’s drinks. Which of these 24 classic cocktails are your favourite?